I've always been a Daddy's girl growing up. My dad is my favorite parent and even my mom knows that. During the rough times my family went through, I even wished that my dad would just leave and take me with him. 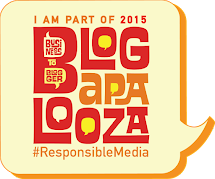 Part of the reasons I was boyish was because I wanted to give my dad a 'son' he can relate to. I may be a girl but I made myself think and act like a boy. When my dad was around, I would watch basketball with him. When he is out on the sea, I record and download action movies to send to him. My husband claims my dad has a son now but that's another story. Being first born has its advantages. That's why I've always told my sisters that I want my child to be the first apo. Aside from the fact that I would prefer that they take their time before building their own family, I thought it would be awesome if my child gets the perks I enjoyed being the first. My dad rarely brings packages from abroad ever since. This year, he had a box full of toys for her favorite. It may be lucky for my dad too that he is the favorite lolo by default. He is the only Lolo (aside from Lolo Titos) and Mila adores him so much. Mila glows with Lolo. When my dad was here, my mom was jealous because Mila only wants to go with Lolo. Sila lang ang magkakampi. Even with my daddy away for work, my heart melts when he talks to Mila though Skype. My little girl loves talking to his lolo and would do all cute things to make him smile. She'd make faces, practice her Po and Opo, sing and dance, and do acrobatics. In one of their conversations, Mila was pretend driving. Immediately, lolo said he will ask lola to buy her an electric toy car. The big one where Mila can ride and drive around on. That costs P5,000 to P10,000 on average. OMG! I had to say no to it though. I tease my dad that he had forgotten about his own children. But in reality, it does not even hurt me a bit when my dad prefers to use up his limited internet minutes just talking nonsense with my little girl. I know it gives him strength and energy during the times that he just wants to quit and go home. I cry when I see him teary eyed talking to my daughter. I wish we had this technology before. I wish we got to share crazy moments with my dad even if he was far. Whenever he calls back then, it was short and sweet because satellite phone was too expensive. I should say I'm sorry that I was not good in keeping our communication with him when we were younger. I know how much he and his colleagues get excited when they receive letters from loved ones. And he always get disappointed because there's almost always no letter for him. There may be the occasional package of magazines and recorded TV shows. But rarely would there be greeting cards, much more long heartfelt letters. Making sure that my daughter is available to talk to him every time he can, that's the least I can do to make up for all those mail days we disappointed him. We promise that Mila will grow up with full respect for her lolo. 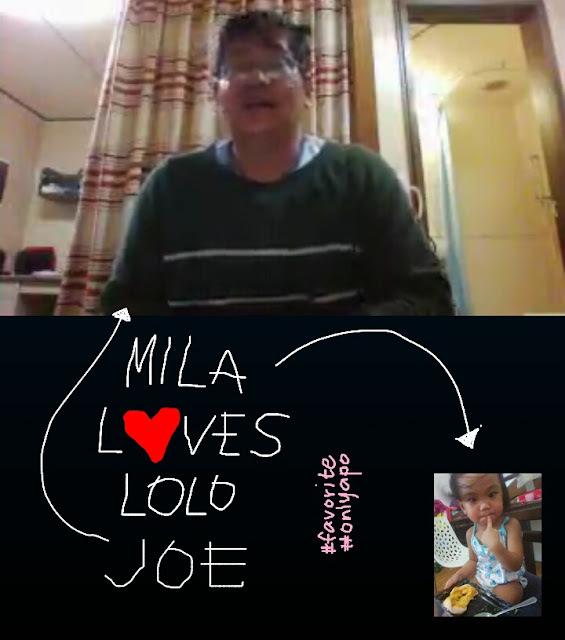 Mila loves lolo Joe as much as I love daddy Joe!